Yesterday (Friday) was Good Friday, a public holiday here. 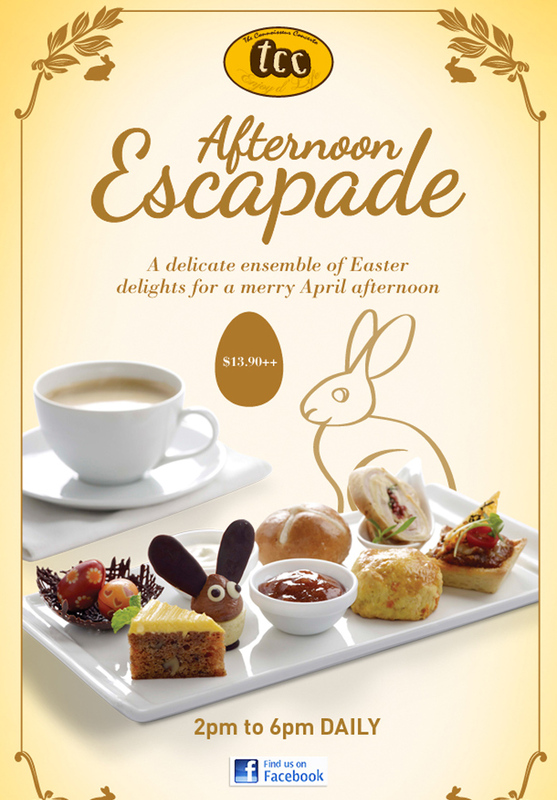 Few days before that I got an advertisement advertising TCC Easter High Tea at $13.90++. Armed with that advertising paper, I showed it to hubby and demanded to be taken there on Friday when we both don’t have to work (long weekend, yippee!). He took one look and said ok. So off we went, me, hubby and Mel at about 2pm. For those who are not familiar with Singapore, TCC stands for The Connoisseur Concerto, a place where you can get gourmet coffee and good food in an artistic and cosy setting. The brand has several art boutique caffè situated all over Singapore, though sadly in the west side where I live there is only one outlet which was in a business park. Each boutique is uniquely designed to suit the area where it is situated and the one we went to has a country feel to it as it was in a shopping mall among housing estate. In my daughter Mel’s words, the design is very ‘me’. I love the country setting, while she likes contemporary chic and ultra modern designs. Parking space was limited at the mall and we had to wait, though it was less than 10 minutes but whenever we have to wait, hubby is sure to grumble. That’s numero uno of his grouses. Then came the menu and grouse numero dos. All the ala carte food item on the menu was in the vicinity of $18 to $20, more than what we would normally pay for for lunch or dinner. That was enough grouses for a day. He kept on about how we could’ve had cheaper pasta (Mel ordered pasta, $20+) at Pasta Mania which would taste equally nice, or that Jack’s Place serves good steaks and seafood at a more affordable price. He tried to smooth it with ‘Oh, but the High Tea set looks good and quite affordable which is why I agreed to come here’ but I didn’t buy it. He wasn’t too pleased. Mel told him the quality of ingredients used here is much better and we kept telling him to judge only when the food is served. And the food is served. 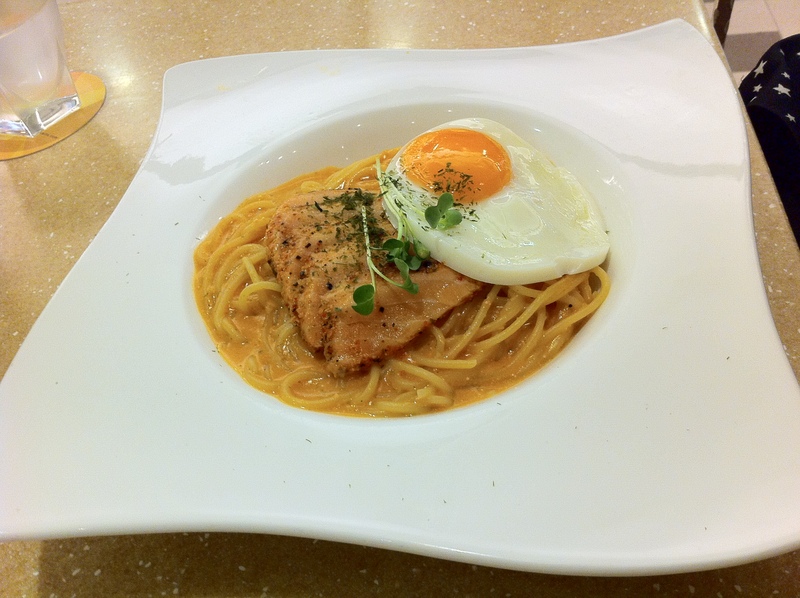 Mel’s Mentaiko Spaghetti with Salmon Tataki came first. She woke up around noon and didn’t have breakfast so she had something heavier. Looks good, doesn’t it? Well, I’m glad that at $20.50, it tastes good, too, though hubby wasn’t too convinced. Then came our Easter High Tea set. He took one look and laughed. The items on the plate in front of him certainly looked smaller than they were on the piece of paper I showed to him. Mel consoled him saying that we could go over to the hawker center nearby for some Chinese fried carrot cake or noodles afterwards if he was still hungry. The items were of course bite size but they tasted heavenly, really! I took one bite at one of the savoury item on the spoon (ham and cheese roll) and was in seventh heaven. It seems that the quality of the food rival that of those served in hotel restaurants that I’ve been too (not many, btw), maybe even better. I especially loved the scone and so did hubby, since the ones I made were always disastrous and tasted nothing like the ones I bought off bakery shops. Well, at least there were something that hubby liked, the scone and the Easter Eggs. 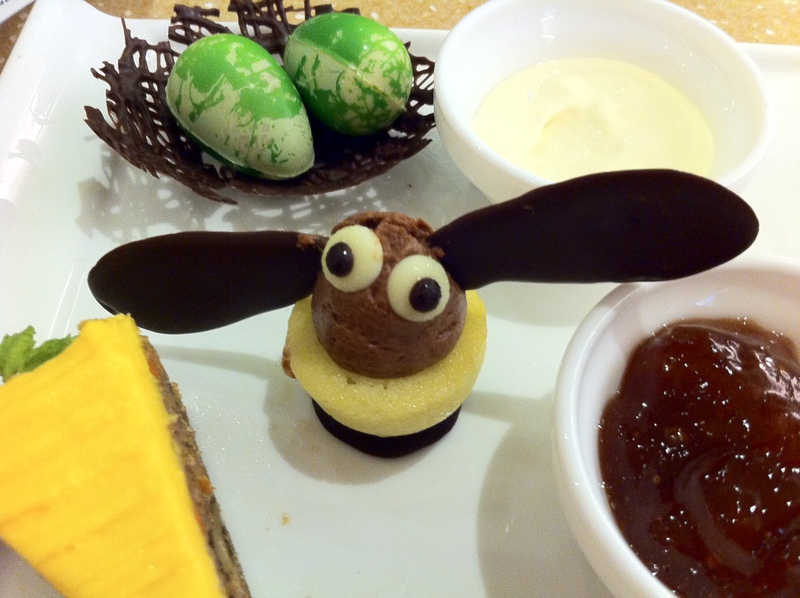 He was very happy with the hazelnut mousse-filled eggs and insisted that Mel had one, along with the chocolate nest the eggs sat on. Of all the items on the plate, he likes the carrot cake the least. Well, at least he didn’t grumble much after the food was served. For me, I loved everything on the plate, including the carrot cake. I had never tasted hot-crossed buns before and I really liked it, especially since it was still warm when I ate it. The pastry crust of the item on the extreme right (squarish one) was thin and crispy and simply delicious. The verdict, as agreed by Mel and hubby, is that I shouldn’t have asked him along for something like this because it doesn’t fill his stomach and he’s more concerned of the price and not the quality. I told him next time I will just ask my sister, Lina, along since we both love English high tea very much. He will have to settle for hawker food instead. No complaining there, hubby. Looked like something I would enjoy….So glad you liked it Judy. Did a High Tea with my mom and dad by accident one time when we were traveling..My mom and I ordered coffee..My Dads remark was They just ordered coffee not the whole plantation..Wonder if they are related??? It does look very yummy. 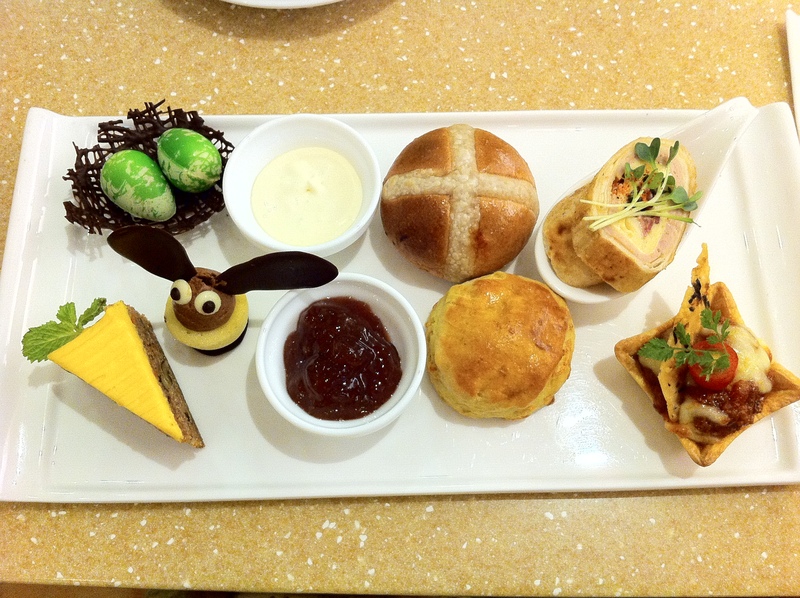 I had high tea only once, in New Zealand. It was really lovely. Good food and good tea and good company. But no wonky bunny ears. 😛 Glad you enjoyed it girl, despite hubby’s grumblings. It’s nice to have a treat sometimes, isn’t it? Grumbling or not, at least your hubby went along. Don’t think I could have gotten mine to go, even kicking and screaming. His comment would be if you want to go, go. I am so glad you and Mel had this treat, we all deserve one now and then. I took my best friend to English High Tea at a tearoom near us once and there was so much food we took some home to our husbands. Dave and I also had a lovely high tea in Victoria at Burchart Gardens. I’d love to have gone with you Judy. Maybe if I visit Singapore again. 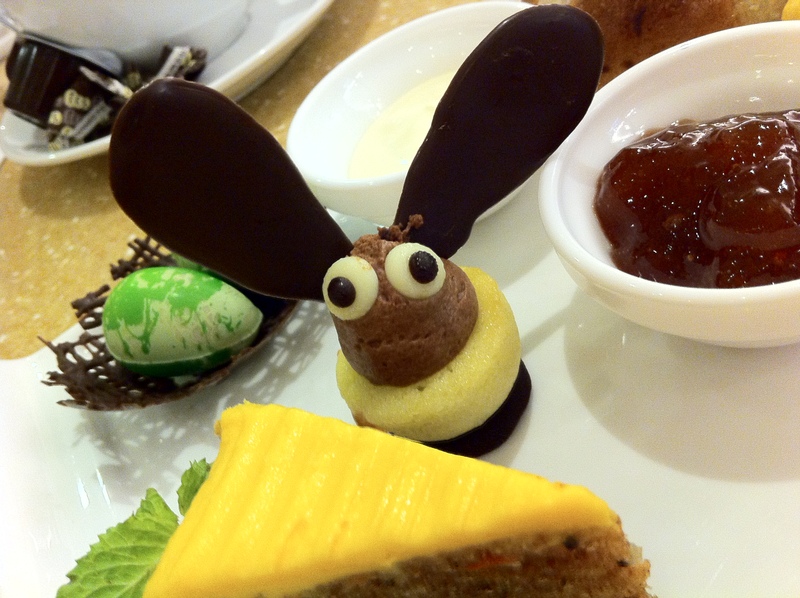 The sight of the chocolate bunny’s ears falling off is funny. Couldn’t stop laughing.